The writer of the book of Hebrews wrote to a congregation about to experience fierce persecution under the rule of Emperor Nero. Only here in all of scripture is the symbol of an anchor used to represent confidence in God who stabilizes his people in life's most fierce storms.Soul Anchor, is a ten-song collection reminding believers of the need to be tethered to hope for the trials of life are not all spent. 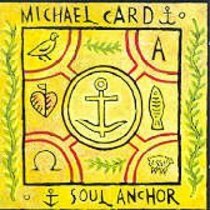 Each line of lyric challenges the listener to carve the symbol of the anchor on the walls of the soul.In Soul Anchor, Michael Card shouts to the faithful, "Grap hold! Seize hope! He encourages all Christians to support suffering brothers and sisters by praying for, weeping with, and standing strong in the storm of life.